Taking turns can be difficult at first. Do you remember that cool red fire truck you never wanted to give up? Or the doll that was too special to part with? Whatever your prized possession was, it was hard giving that toy to someone else. 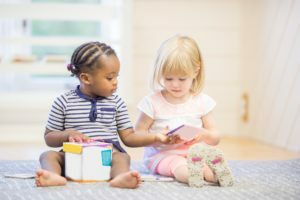 In preschool years, children are still learning how to share, so it is okay if your child isn’t great at this skill yet. At this age it is typical for children to play side by side in what we call parallel play, but not really with each other. That’s fine! They are still learning how to interact socially and play together. Set limits up front. 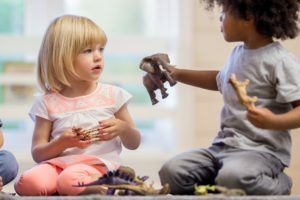 When kids are learning to take turns it can be hard to know when it’s time to give a favorite toy to their friend or sibling. Something visual, like a timer, will let children know exactly when it’s time for them to give up a certain toy. Correct their behavior. If a situation occurs where a child reacts negatively to another child playing with a toy they wanted, explain that they can have a turn next. The APP says that children under 3 years old are not able to understand sharing without lots of adult encouragement. Preschool age is when children are learning how to share and correcting their actions in the moment will help them learn. Model and point out good behavior. Although it’s important to talk about taking turns and sharing, seeing it will help too! For example, point out how nice it was that Dad shared his water with Mom. ‘Thanks for sharing, Dad!’ Even pointing out when an older sibling takes turns or shares will help encourage them. Talk about sharing toys with friends. Before a playdate talk about why it’s important to share with their friend. Let them know that it’s okay if their friend plays with their toys for a little while and when they go to their friend’s house their friend will share toys too! Talk about how it would feel if they went to a friend’s house and wasn’t allowed to play with any toys. If your child has a toy that is their absolute favorite that they do not want to share, put it away before the play date! As long as they are good about sharing other toys it’s okay to have a special one just for them. The skills your preschooler is developing through play will help them throughout their life. 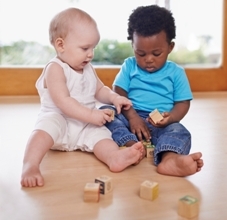 Social interactions with peers, even at a young age, can help development. The back and forth of turn taking shows children there is a social aspect to play. 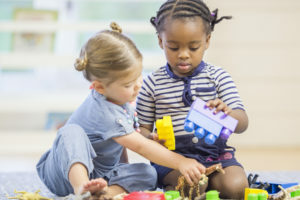 Learning how back and forth turn taking works during play, helps teach a similar lesson in their speech development, and that communication is a back and forth interaction. Learning how to take turns with others and stay in control of their emotions are two foundations of executive functioning skills, which will be very important as they enter grade school and beyond. Is your little one having trouble transitioning to preschool? Try these ways to decrease separation anxiety. All 6 stages of play involve exploring, being creative, and having fun! Find out which stage your little one is in. Excellent post. Encouraging kids to interact socially is very important. Previous Previous post: Why Are Mirrors Good for Baby?